Marina is no different. Although Zafon labels it as a YA book, I find its story appealing to all ages.The is mainly a thrill, but as all his books, there is this touching drama underneath. We read about love, struggle, loneliness and hope. We read about different characters whose experiences resemble ours. The story revolves around some magic realistic events that the protagonist of the novel goes through with his friend. The story is a page-turner, but I found the book intriguing for three reasons. The first one is what I mentioned earlier of Zafon’s ability to resurrect Barcelona! The second is the writer’s introduction and ending of the book. In this part, Zafon contemplates life and revisit the time in which he wrote the book and how after rereading it, he found that it was the time to bid farewell to writing YA fiction. In what I felt like a note of sadness, he wrote about how each one of us would come to a moment in her or his life in which they find themselves obliged to say goodbye to their youth. In this part he captures the sadness and also the tenderness of reaching this moment. This tender/sad note is also portrayed in the novel itself where Oscar was obliged to say goodbye to his beloved Marina. Those complicated feelings we feel when we face our impending departure are so hard, and Zafon tries to show us that they we should accept the fact instead of living in denial. 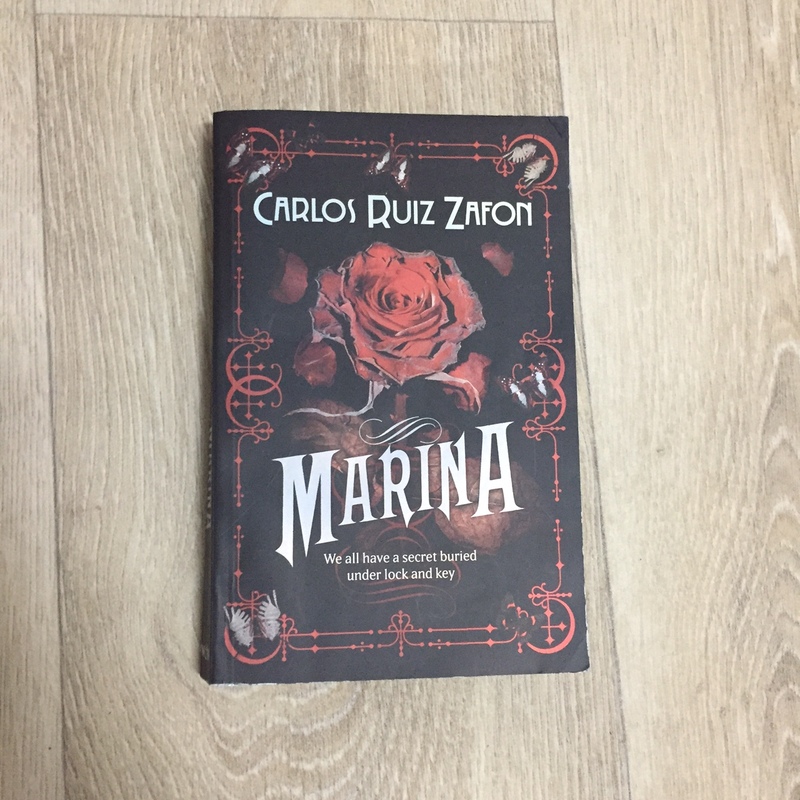 The last reason is the way Zafon presents women in his novel- not only Marina, but also in The Cemetery of Forgotten Books. I would not say that he is a misogynist, no, I would say rather he is a very old fashioned? Women are always in the shadow in his dominated male novels. The only role they play is being beloved. Although he always describes them in an affectionate way and makes them one of the main reasons behind his protagonists and other male characters’ adventures, the female characters in his books always die or somehow just disappear from the picture! His male characters are like Medieval knights celebrating the chivalric code; they do the impossible for their beloveds. I was happy when I read about the strong –minded Marina, I thought yes finally a leading female protagonist, but well then she died. At least the novel is named after her. The female characters in Zafon’s novels are worth further examination. Marina presents a coming of age story of Oscar. It thus belongs to the Bildungsroman genre in which a young protagonist who is attempting to learn the nature of the world, discover its meaning and patterns, and acquire a philosophy of life and “the art of living. To achieve this, Oscar, like the typical Bildungsroman protagonist, experiences among many things, alienation and ordeal by love, and this journey consist of self- education as he searches for a vocation and a working philosophy. This part of the story is interesting as many YA books now present different coming of age stories.